Tungsten (W) has the highest melting point of any metal; well over 3000 degrees Celsius! It is hard, brittle, and very similar in appearance to Tin (Sn). Tungsten comes from the Swedish, tung sten, meaning heavy stone. It was formally known as wolfram, hence the mineral wolframite that contains tungsten. China is thought to hold 3/4 of the world’s tungsten deposits. 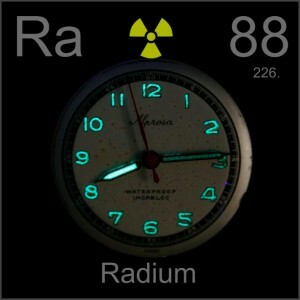 Radium is hot stuff! It was used in self-luminating paints on alarm clocks and other devices into the 1950s, when it fell out of use due to the radioactive impacts on the paint process employees. Its chemical symbol is Ra and its atomic number 88. 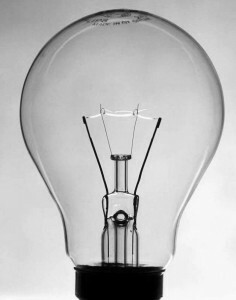 This means it has 88 electrons 88 protons. Check out this video of a fantastic thrift store find! The famous Madam Currie discovered radium in 1898. Read a very interesting retrospective from the Atlantic Monthly on this once alluring but very dangerous element. The element of the week this week is Gold. Gold’s chemical symbol is Au and its atomic number is 79. It is the most malleable and ductile of the metals. Its melting point is over 1000 degrees C! All of the refined gold in the world would easily fit under the Eifel Tower. Our friends from Nottingham visit a vault in London. Wait for the end of the video for more links to more gold videos. Learn how to identify fool’s gold, how to make a gold plated watch, and more! 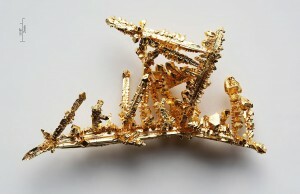 The image to the left is of gold crystals produced synthetically in the lab. 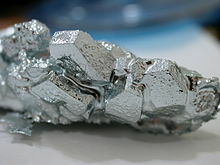 The Element of the Week is Gallium! Atomic #31 on the periodic table. This amazing metal will melt in your hand and when combined with arsenic (gallium arsenide) makes a powerful solar cell. And it does great for a disappearing spoon trick.